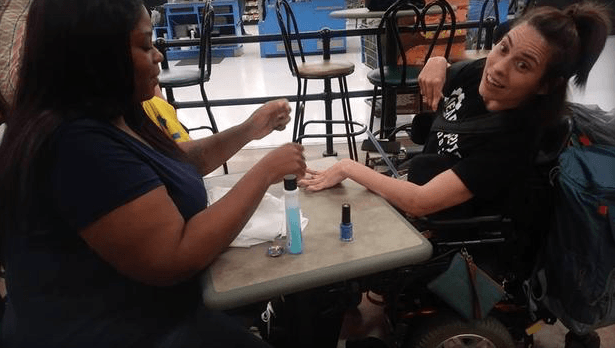 #TSRPositiveImages: Nail Salon Reportedly Turned Away Woman With Disability, So Walmart Employee Used Her Break To Paint Her Nails! #Roommates, never underestimate the power of a small gesture, because sometimes it’s the little things that can make a person’s whole day! After a woman with cerebral palsy was reportedly turned away from a nail salon for moving too much, a Walmart employee stepped in to paint her nails for her. “Found out what happened and I just asked her, ‘Do you want me to do your nails?’ And she just started smiling and said yeah,” employee Ebony Harris told CBS affiliate WNEM-TV. Tasia Smith, who works at the Subway in Walmart, saw the sweet moment and shared it on Facebook. “Today, this sweet girl went into burton Wal-Mart’s nail salon ‘Da Vi nails’ and they denied her service because ‘she moves too much’.. Out of the kindness of the Walmart workers hearts they went and bought nail polish and came into my work to paint this sweet girls nails,” she posted. Let’s keep sharing this kind of energy, Roomies!